What’s better than a perfectly soft and chewy chocolate chip cookie? One that’s super nutritious, Paleo, vegan and perfumed by strawberries! This recipe includes both freeze-dried strawberries and strawberry puree for maximum strawberry flavor. 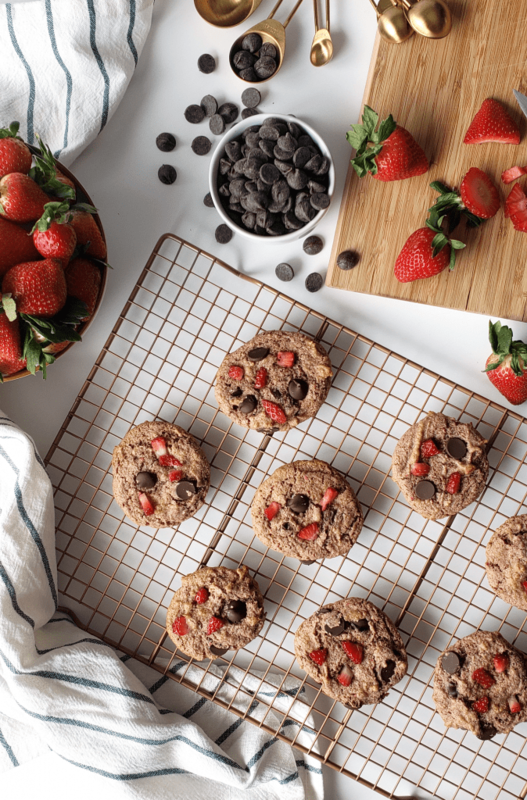 Make these healthy strawberry chocolate chip cookies for loved ones and enjoy them yourself. They’re the treat that loves you back! Of all the treats to enjoy on occasion, a chocolate chip cookie might he the most quintessential. There’s just something about the soft, chewy texture and sweetness of the chocolate chips that makes it so comforting. The problem is, chocolate chip cookie recipes have been done. A lot. Even grain-free, Paleo and vegan chocolate chip cookies. Search Google or Pinterest and you’ll find thousands of recipes. But for a special day like Valentine’s day, I want to make something unique. So how do I improve on a perfectly soft and chewy chocolate chip cookie that’s Paleo, grain-free and vegan? Add strawberries, that’s how! Introducing my Healthy Strawberry Chocolate Chip Cookies that are about as nutritious as a cookie can get as well as grain-free, Paleo and vegan (dairy-free and egg-free). Because it’s not just Valentine’s Day, February is also Heart Health Month! Thanks to almond flour, these strawberry chocolate chip cookies are good for your heart! Almonds are an excellent source of fiber and healthy fats, both of which have been shown to improve blood fats, keep blood sugar steady and contribute to maintaining a healthy weight. Nutrients like copper, manganese and vitamin E are crucial for fighting free radical damage throughout the body, and magnesium helps blood vessels relax. When blood vessels relax, blood is able to flow more freely, making the heart’s job easier. Perhaps that’s why research has found an association between magnesium deficiency and heart attacks (source). Strawberries are among the most nutrient-dense fruits. They’re full of fiber, vitamin C, folate, and manganese, and lots of polyphenol antioxidants that fight inflammation and free radical damage in the body. On top of that, research has attributed strawberries to improving blood sugar regulation and keeping the heart healthy (source). What’s goes perfectly with strawberries? Chocolate! And let’s not forget about chocolate because it, too, is good for the heart. The primary component of dark chocolate – cocoa – is full of antioxidants that can trigger the release of nitric oxide in blood vessel linings. Nitric oxide helps blood vessels relax, which can help improve blood pressure. These same antioxidants also protect cholesterol from damage, which can help keep the heart healthy (source). Don’t just enjoy a treat this Valentine’s Day, enjoy a Healthy Strawberry Chocolate Chip Cookie so nutritious that it’ll love you back! 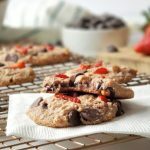 This recipe for Healthy Strawberry Chocolate Chip Cookies uses both freeze-dried strawberries and pureed fresh or frozen strawberries. Using both really maximizes the natural strawberry flavor! That’s a lot of strawberries, so let’s talk about them. Strawberries are incredibly nutritious and undoubtedly delicious, but conventionally-grown strawberries are also commonly contaminated with pesticide residue. Strawberries top the Environmental Working Group’s Dirty Dozen list year after year, and the USDA has even found some conventionally-grown strawberries to have more pesticides than what the EPA deems safe (source). That’s scary, guys! Protect yourselves and your kiddos from those chemicals and spend the extra money to buy organic strawberries. I know that fresh organic strawberries can sometimes cost an arm and a leg, so I’ve given you the option to use frozen organic strawberries. They’re very affordable at Costco and can also be found at Natural Grocers, Whole Foods and lots of other supermarkets. Just be sure to wash any ice off before thawing them (so they’re not too watery). Want even more strawberry flavor? Top the cookies with finely chopped fresh strawberries before baking! This dough is sticky, so I find it easiest to use a cookie scoop like this one. It makes the process of measuring, scooping and shaping them go so much faster! I also use it to make meatballs, like these Lamb Meatballs over Saffron Cauliflower Rice. It’s just one of those tools that makes my life easier, so I’m a fan! Just be sure to rub the cookie scoop with a little avocado oil before scooping so the dough doesn’t stick. Almond flour: I’ve found the best price on blanched, finely ground almond flour at Costco. Natural Grocers also sells their brand for a great price. Some options are also available on Amazon. Strawberries: Once again, please buy organic strawberries to avoid all of the pesticide residue that commonly contaminates them! I talk about where to find organic frozen strawberries in the section above, but what about freeze-dried strawberries? I’ve found the best price on organic freeze-dried strawberries at Natural Grocers, but if you don’t have one nearby, check out VitaCost. 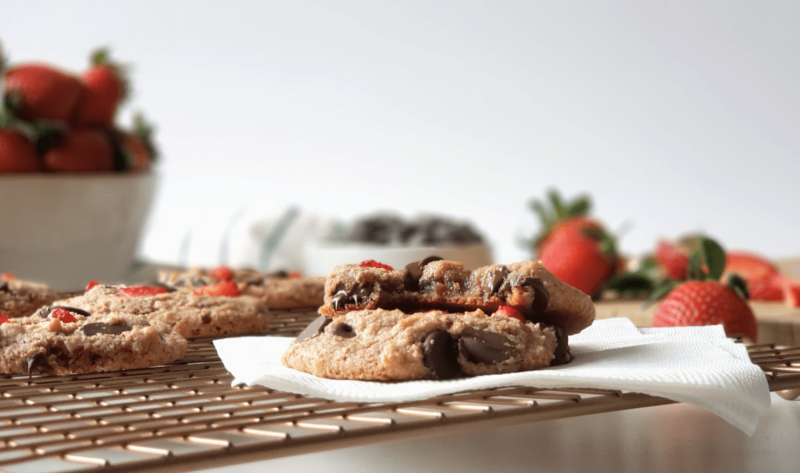 Chocolate chips: Keep these strawberry chocolate chip cookies free of allergens (gluten, dairy, egg) by choosing EnjoyLife Semi-sweet Mini Chips or Pascha Dark Chocolate Chips. 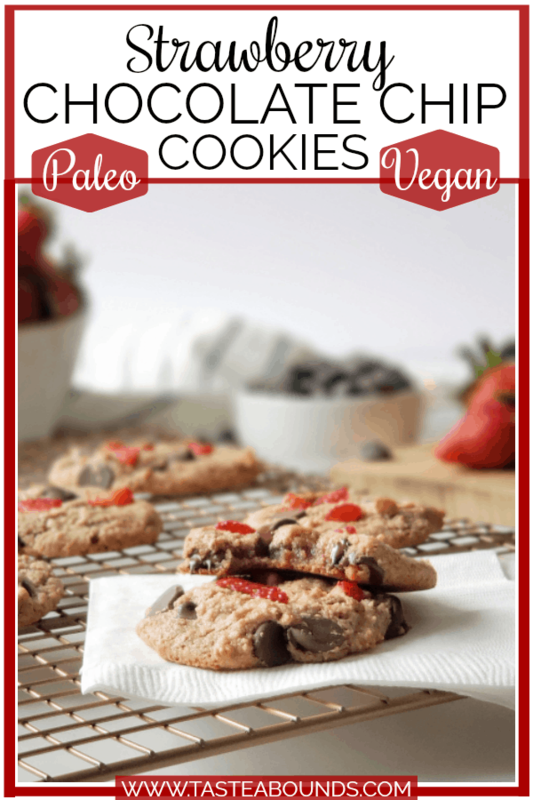 Looking to keep these cookies Paleo and/or perhaps keep the sugar to a minimum? Check out Lily’s Dark Chocolate Chips sweetened with stevia. All of these are sold at VitaCost and most Natural Grocers. Is your mouth watering for a healthy strawberry chocolate chip cookie yet that is full of yummy flavor and nutritious ingredients? Well okay then, let’s get on with the recipe! What's better than a perfectly soft and chewy chocolate chip cookie? One that's super nutritious, Paleo, vegan and perfumed by strawberries! This recipe includes both freeze-dried strawberries and strawberry puree for maximum strawberry flavor. 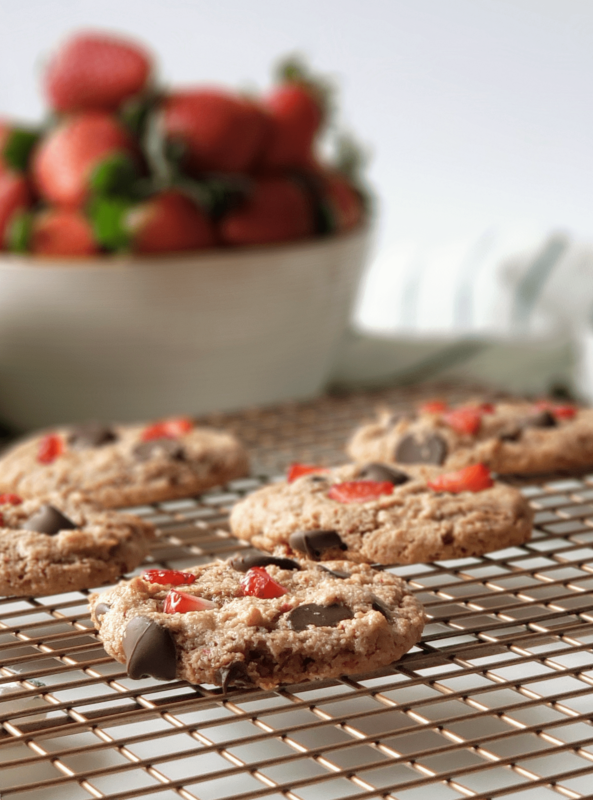 Make these healthy strawberry chocolate chip cookies for loved ones and enjoy them yourself. They're the treat that loves you back! Preheat oven to 350 degrees Fahrenheit. Line cookie sheets with parchment paper. Mix dry ingredients in a large bowl. Grind the freeze-dried strawberries into a powder in a food processor and mix into the dry ingredients. Mix wet ingredients in a separate bowl before combining with the dry. Switch to a sturdy spoon and mix until the batter is well combined. Stir in the chocolate chips. Oil a 1 Tbsp cookie scoop. Form each scoop of dough into a ball before arranging 2” apart on a cookie sheet lined with parchment paper. Press a few pieces of chopped strawberry into each cookie, if desired. Bake at 350 degrees Fahrenheit for about 10 minutes. Remove and let cool before devouring! Be sure to rub the cookie scoop with a little avocado oil so the cookie dough doesn't stick! These sound delicious! I love that they are grain-free and honey-sweetened, too! My boys love chocolate chip cookies and strawberries… these strawberry chocolate chip cookies might be their new favorite. I am definitely going to make them for a Valentine’s treat. Thank you! I hope your boys enjoy them! strawberry and chocolate is such a lovely pairing. love to make this for Valentine’s Day! How fun to include strawberries in a cookie. A great sweet treat! Oh gosh this is so special! My girls would love these! Thanks! LOVE the idea of adding strawberry puree to the cookie dough. Brilliant! This is so creative and looks amazing! Chocolate and strawberries are the best combo, and I can’t wait to make this. I LOVE chocolate and strawberries and you made them possible together in cookies! A dream come true! Chocolate & Strawberry is always a winning combo for me! Gorgeous! It’s pretty hard to beat chocolate and strawberries, and these cookies look so good! Love the addition of strawberries – I bet they taste sooo good with the chocolate chips! We currently have strawberries in our garden, probably the last crop for our Summer so this recipe is just in the nick of time for me! Oh yum- this is a great combinations! I love putting strawberries with chocolate, and in cookies- that would be so good! I MUST try these! They look too good, and the double dose of strawberries!!!! The strawberries and chocolate with the yummy center in these cookies make my mouth water. I have to try this recipe! I love this combination! Just perfect for Valentine’s Day. Healthy cookies – yes! Love the strawberries in here. A great treat.